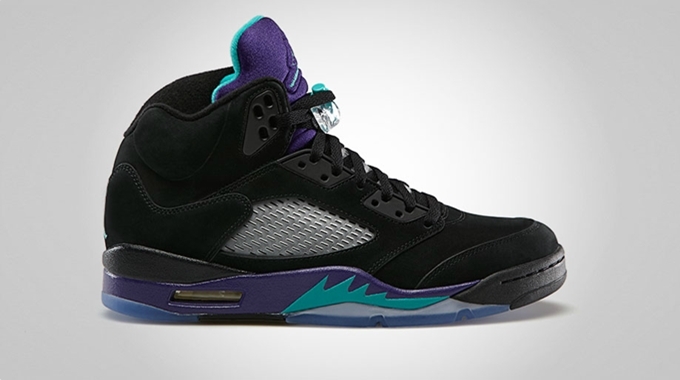 After it was released in the now-popular “Grapes” edition, a new colorway of the Air Jordan 5 Retro is now available and it expected to make an impact as well. The retro kick is now available in a black-based edition of the classic Grapes colorway, which is officially listed as the Black/New Emerald-Grape Ice-Black colorway of the shoe. The impressive kick features a full black nubuck based accented with the traditional New Emerald and Grape Ice accents. This shoe is tagged as a limited release so make sure to grab your own pair immediately.